Lovely weather here again this weekend. We drove up to Wash, DC yesterday to visit the National Gallery of Art to see an exhibit they have currently of art that was inspired by the forest surrounding Fontainbleu in France. Mr Peachez and I visited Fontainbleu last summer on our 20th anniversary trip. The exhibit was lovely. Then we took the kids to the Spy Museum and that was fun. But on Friday I did find a few fun things at the thrift store. Figurines that will be given to Beth to use in creating her one of a kind FABULOUS pin cushions. These items are just for fun. 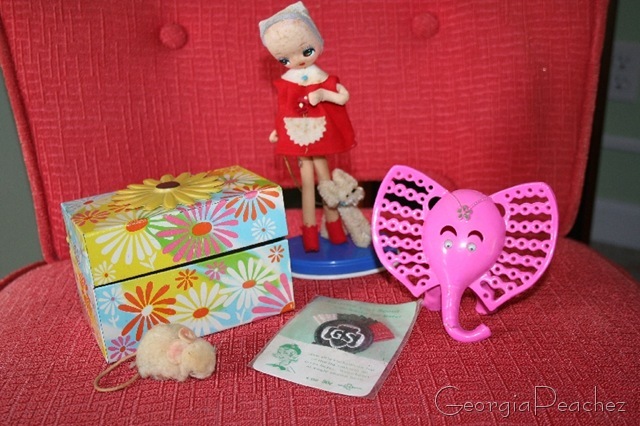 Love the flower power index card box and the metal elephant earring holder. These I just adore. 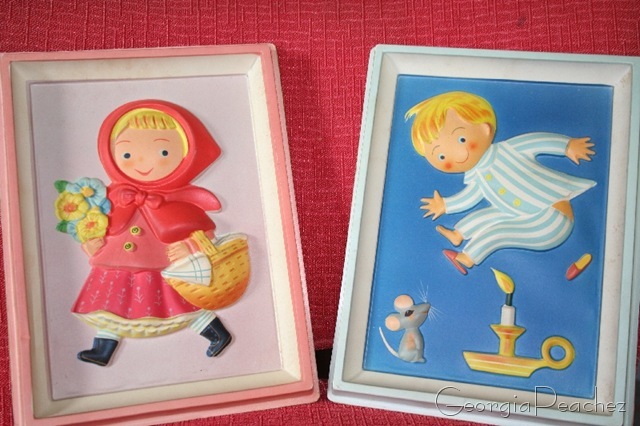 They are made of a pressed plastic. The little girl is just too cute! These are too much fun! Vintage chenille stem bugs with googly eyes. This little snail is my FAV. Those pictures are adorable! 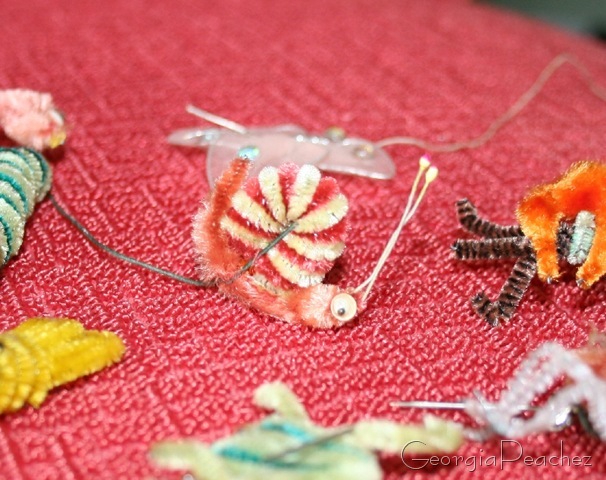 I have some of those chenille critters and just love them. 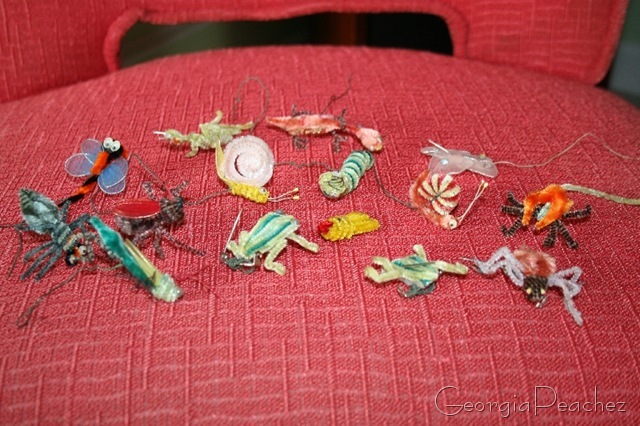 Mine included some chenille houseflies, which creeped me out so much I had to throw them away! But I love the snail, too, and the caterpillar! 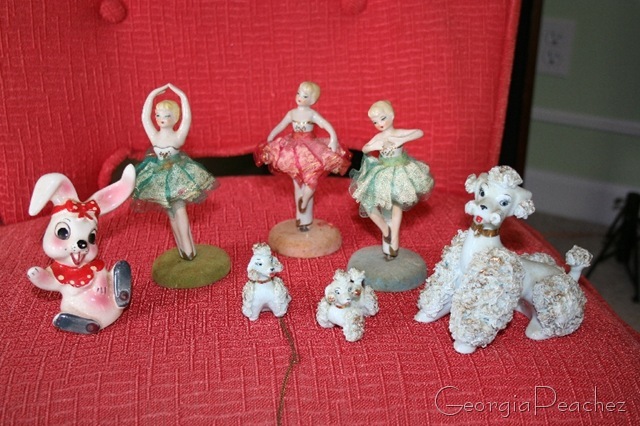 I had one of those ballerina figurines when I was a girl…not sure what ever happened to it but you sure found cute things. The cosmetic bags are very nice. Luv the Bugs! Sweet finds. I know God loves us cause he gave us Thrift Stores! Love, love, love the bugs. They would be SO fun in a specimen box with little typed up labels and pins. It makes the biologist in me swooon with envy.